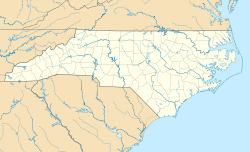 Midland is a town in southern Cabarrus County in the U.S. state of North Carolina. Located in the south-central portion of the state, it lies in the region known as the Piedmont. The name of the town is derived from its location approximately halfway between Charlotte and Oakboro on the railroad line. As of the 2010 census, the town population was 3,073. Midland began as a railroad town about 1913 with the arrival of rail service via the North Carolina Rairoad (NCRR). The town is now incorporated, as of 2000. Prior to Midland's becoming a railroad village, a community named Garmon existed in the area (a few miles to the east) and appears on an 1864 map of North Carolina. Cabarrus Station predated Midland as a railroad stop, and is now part of Midland. The Reed Gold Mine, site of the first discovery of gold in the United States, is located east of the town. The Reed Gold Mine is now an historic site under state management and is open to the public. Visitors to the mine can tour a museum with extensive information and displays on North Carolina gold mining, and can walk through several hundred feet of mine tunnels. The area was an important gold mining center in the 19th century; however, gold mining activity in the region predates the founding of Midland. Beatties Crossroads, the crossing of U.S. Route 601, and NC 24/NC 27, had a Ford Showroom built nearby in the early 1920s. It was refurbished into a mill years later. Beatties Ford Road in Charlotte is named after this building. The town sits approximately 500–550 feet (150–170 m) above sea level. The land is gently rolling with no especially high points. The most common soil type is a red clay. The area is drained by the Rocky River, which is relatively small and generally shallow. Trees are abundant. There are no significant lakes in the town. Coordinates for Midland are 35°13′38″N 80°30′03″W﻿ / ﻿35.22722, -80.50083. The town is located approximately 249 miles (401 km) northeast of Atlanta, 526 miles (847 km) southwest of New York City, 614 miles (988 km) southeast of Chicago, and 650 miles (1,050 km) north of Miami. From Midland, it is 2,423 miles (3,899 km) to the Equator and 3,792 miles (6,103 km) to the North Pole. During the past two decades, new businesses have tended to locate north of Midland near the intersection of Highway 601 and State Road 24/27. Midland has an increasing number of businesses owing mainly to companies locating in the town which, with improved highways, is now more convenient to Charlotte and surrounding areas. Essential services remain limited. A physician's office is now located in Midland, but hospitals with emergency services are located in Concord and Charlotte. A few family-type restaurants and food stands may be found in Midland. A bank is located in the town. Automobile fuel and repairs are available. Midland has a few farm supply stores, including a Tractor Supply Company. A public elementary school is located near the town, and a middle school and a high school serving the area are located near Concord. There are no military installations in the area. Nearby communities include the settlement of Cabarrus, also known as Cabarrus Station, a former railroad stop like Midland and now within the Midland town limits. Also nearby are the communities of Locust and Stanfield, located in adjoining Stanly County, and only a few minutes' drive from Midland by automobile. These communities are similar to Midland in many ways, but Locust does now have a chain supermarket and some other nationally-branded businesses. ^ a b "2010 Demographic Profile". United States Census Bureau. http://www.census.gov/popfinder/?fl=3702593688:3742760. Retrieved 10 January 2013. ^ "Geographic Identifiers: 2010 Demographic Profile Data (G001): Midland town, North Carolina". U.S. Census Bureau, American Factfinder. http://factfinder2.census.gov/bkmk/table/1.0/en/DEC/10_DP/G001/1600000US3742760. Retrieved December 18, 2014. This page uses content from the English language Wikipedia. The original content was at Midland, North Carolina. The list of authors can be seen in the page history. As with this Familypedia wiki, the content of Wikipedia is available under the Creative Commons License.